I'm trying to do a Least Cost Path analysis, following upon these suggestions. A iniciar o algoritmo r.drain - Traces a flow through an elevation model on a raster map.... g.proj -c proj4="+proj=utm +zone=22 +south +ellps=GRS80 +towgs84=0,0,0,0,0,0,0 +units=m +no_defs" r.external input="C:/.../Exercicios em teste/Novos exercicios/Least Cost Path/Cumulative-cost.tif" band=1 output=tmp14908042929517 --overwrite -o v.in.ogr min_area=0.0001 snap=-1 input="C.../Exercicios em teste/Novos exercicios/Least Cost Path" layer=Pontos-Alvo output=tmp14908042929518 --overwrite -o g.region -a n=9840380.0 s=9840130.0 e=785141.0 w=784667.0 res=1.0 r.drain input=tmp14908042929517 start_coordinates="(0,0)" start_points=tmp14908042929518 -c -a -n output=output41993ef1fbf245b780c12dd73c1c4c96 --overwrite g.region raster=output41993ef1fbf245b780c12dd73c1c4c96 r.out.gdal --overwrite -c createopt="TFW=YES,COMPRESS=LZW" input=output41993ef1fbf245b780c12dd73c1c4c96 output="C:/.../Exercicios em teste/Novos exercicios/Least Cost Path/LeastCostPath.tif"
C:\PROGRA~1\QGIS2~1.14\bin>r.external input="C:/Users/.../Exercicios em teste/Novos exercicios/Least Cost Path/Cumulative-cost.tif" band=1 output=tmp14908042929517 --overwrite -o ATENÇÃO: Over-riding projection check Reading band 1 of 1... r.external completo. Link to raster map created. 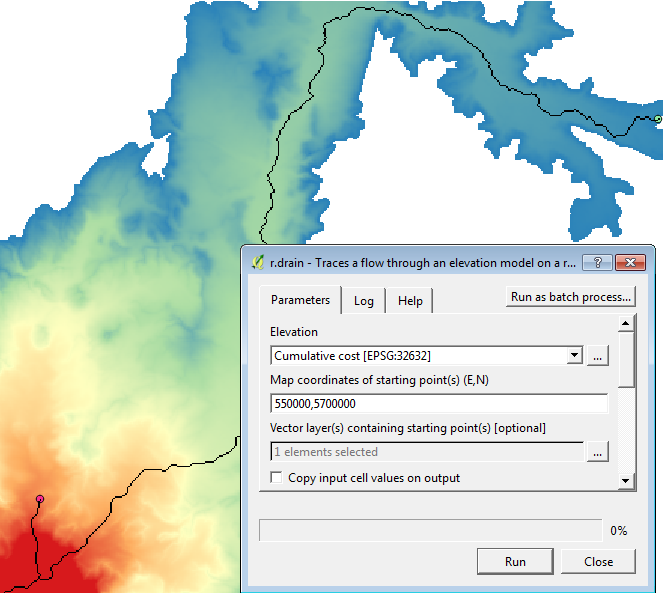 Description: Traces a flow through an elevation model or cost surface on a raster map. I can't figure out what am I doing wrong. As @markusN has pointed out, the message start_coordinates="(0,0)" reported that you have left Map coordinates of the starting point(s) untouched, like the image below. Using QGIS2.14 we have to be very careful, as r.drain shows (0,0) by default. If E,N coordinates are given with brackets (), r.drain fails with error message as in OP. If E,N coordinates are 0,0 (outside of the raster area), r.drain still fails with error message as in OP. If the given coordinates are outside of the Cost Surface has values (but still in the raster area), it finishes calculation without error and returns Least cost path layer. Of course, the layer is blank. Please see below how it works when the E,N coordinates are given as 550000,5700000 (which is red point at the LR corner). In this example an optional Vector layer (green point) was also added. A good news is that recent QGIS2.18 changed its UI to show 0.0,0.0 without brackets. Not the answer you're looking for? Browse other questions tagged grass qgis-processing or ask your own question. Finding Least Cost Path in QGIS?